Did you know that as a Sage 300 ERP customer (formerly Sage ERP Accpac), you and your employees can access payroll history online? By logging into Sage Source - a cloud application and online portal - you get anytime access to valuable business resources that complement your Sage 300 ERP system. To get started, all you have to do is register at Sage Source using your Sage customer ID and email address. You can then invite others in your organization to sign up for Sage Source through the easy-to-use interface. Pay History - provides a summarized and historical view of payroll information that’s accessible online 24x7. Company Announcements - post company-wide news and announcements that are accessible to employees in the office or on the road. Company Directory - easy online access to employee contact information like names, phone, and employee photos. File Cabinet - secure, online document repository for easy access to commonly used files. Perhaps best of all, Sage Source is a free benefit to all Sage 300 ERP (Accpac) customers on a current Business Care plan. Plus, there’s no implementation or IT involvement required so it really simple setup and get started. 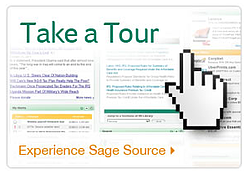 Sign up and take advantage of Sage Source today! P.S. Check out the most Frequently Asked Questions (FAQ) about Sage Source to learn more.